High-end purists have always thought of integrated amplifiers as a compromise. Most consider them acceptable when products cost hundreds rather than thousands, or for those that value the compact solution over outright sound quality. We’re not sure what they’ll think of the 032, but we like it a lot. This is Burmester’s top integrated amplifier. At over 12 grand it isn’t cheap, nor with a 48 x 48 cm footprint, small. Sitting on our equipment rack it dwarfs our reference Bryston BP26/4BSST2 pre/power combination and is about as imposing a one-box amplifier as we’ve come across. As is typical for the German brand this unit is superbly made. While the combination of heatsinks all-round and reflective chrome front panel may not be to all tastes there no denying the impressive quality of it all. Every panel is precisely lined-up and each control feels like it is built to work for decades. Having visited the company’s factory we can testify to the seriousness that Burmester approaches the manufacture of its products, and the commitment it has to being able to service them for decades to come. Potentially problematic components such as switches and input selector mechanisms are tested to destruction and engineered to last a lifetime. In our experience, few of the company’s rivals work to such standards. Take that hefty but beautifully machine top panel off and you’ll find a generous power supply, dedicated boards for the left and right power amplification (bolted to the side of the casing) and a neat, well-spaced circuit layout. There’s plenty of evidence of the kind of attention to detail that a product at this level deserves. Connectivity is good. Burmester has long promoted balanced connections, so it’s no surprise to see them in the majority here. There are four sets of balanced XLRs, including one intended for an AV processor. Using this input takes the signals straight into the power amplifier section bypassing the preamp stages all together. For those that don’t use balanced sources there are two single-ended inputs, as well as a tape output. Should the 032’s 105 watts per channel be not quite enough for your tastes there’s also a choice of single-ended and balanced XLR preamp outputs to allow connection to an external power amplifier. While that power figure may not seem particularly impressive given the price, we think it would take an unusually difficult-to-drive pair of speakers or a room the size of an aircraft hanger before we felt the need for any additional grunt. This integrated is a pleasure to use. The volume control has a hefty, well-damped but very precise feel to it, and the amplifier’s on-board software is quick to respond. All the front panel controls work with precision, and even the remote has more luxurious leanings than most alternatives we’ve come across. Delve into the menus and you can trim input levels to prevent large differences in volume when you switch between sources. There are bass and treble adjustments too, but thankfully they’re subtle in operation to prove useful in certain circumstances. The 032 is a big unit, and weighs in at around 40kg, so make sure your equipment support is sturdy enough. It’s also advisable to get help when unpacking the product – those heatsinks can be a little sharp and that hefty weight makes it an uncomfortable single person lift. While the use of such extensive heatsinking suggests that the amplifier runs hot that doesn’t prove the case. Its casework only gets slightly warm during our testing despite playing demanding music at high levels. But, as always, we would advise leaving plenty of fresh air around the amplifier to prevent any possible build-up of heat. At this level good system matching is a must to get your money’s worth, and so it proves here. The 032 thrives with highly transparent sources and speakers. Get it all right and this is an astonishingly capable performer. The 032 has an understated approach to music replay that doesn’t necessarily grab the listeners attention, initially at least. It’s only when we spend an afternoon listening to a variety of songs, and go back to alternative amplification we know well, does it click just how capable this integrated is. There’s not a hint of coarseness or grain in the presentation and that leaves it sounding pure and precise. 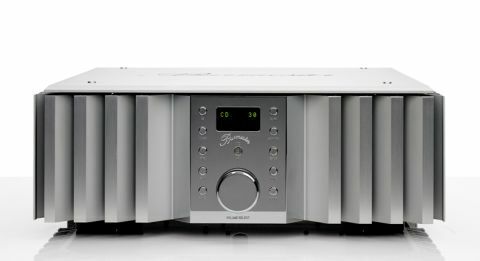 Previous Burmester amplifiers (we’ve reviewed) have always had a smooth, full-bodied balance and this one is no different. The 032’s presentation is as refined as they come, and despite class leading resolution, doesn’t go out of its way to highlight shortcomings in the recording or partnering system. You’ll certainly know all about any flaws but somehow the amplifier always keeps the musical message front and centre – a rare trick for such a revealing product. We’re reminded of this quality when listening to Eminem’s Recovery set. This recording tends to sound hard and thin on most equipment, but through the Burmester we’re aware of a degree of natural warmth and weight we don’t normally hear. Eminem’s rapid-fire delivery on Not Afraid comes through with an engaging fluidity, and every word is crisply rendered and easy to follow. His trademark aggression is unmistakable, and delivered in a concentrated dose. Just as importantly, the 032 doesn’t tone down the rhythmic drive or hard-edged attack of this track. It delivers the sound in a punchy and articulate way, making the most of the excitement on offer. Switching to Arvo Part’s Cantus in Memory Of Benjamin Britten shows off the Burmester’s impressive scale and resolving powers. This track features a densely layered string section and the 032 takes it all in stride. It communicates the texture of the strings without the edge that some rivals add, and renders the shifts in intensity with great skill. We’re impressed with the integrated’s authority here, and its dynamic reach as the piece steadily builds to a crescendo. There’s no trace of stress, with the Burmester sounding calm and composed even when pushed hard. This is a smooth and organic presentation we’re sure many will love. The 032 also sets-up a wide and expansive stereo sound stage. It extends well beyond the outer edges of our reference ATC SCM 50s and is nicely arranged and focussed sharply. Moving on to music from Nina Simone shows the Burmester’s unfussy nature when it comes to musical genres. We love the articulate way this amplifier deals with her passion-laden vocals on Strange Fruit, planting them firmly centre stage. There’s everything we would want here: subtlety, presence and power. Every stroke of the sparse piano backdrop adds to the track’s emotional impact. We’re transfixed until the song ends. At times like this, hi-fi is magical. We give the amplifier’s headphone circuit a try and we’re happy with what we hear. The output is inconveniently positioned on the back panel, which makes it a real pain to connect once the amplifier is in position, but we notice the same combination of insight and refinement that we liked so much from the speaker outputs. There is no issue driving a range of headphones, with the 032 working well with Grado’s PS500s and BeyerDynamics’ T1s. This is a well-engineered output. The 032 is many things. It’s big, pricey and has an appearance that will split opinion. It’s also fabulously well made and sounds as good as any amplifier we’ve heard near this money, including pre/power alternatives. If you have an appropriately talented system take this one seriously. You’ll be pleased you did.